The Historic Tour of Savannah by Segway shows you the tree-lined streets, beautiful squares, magnificent parks, old world architecture and historical district that makes Savannah an ideal city for a fun, exciting tour that only a Segway can provide. It is the best way to see the city! 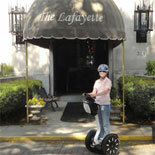 Tour Savannah on a Segway! 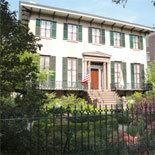 Historic Savannah is built around 22 Squares with many interesting forms of architecture and stories. Take an up-close and personal tour of Savannah while having fun. 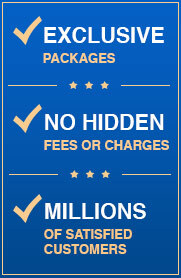 Learn all about the rich history of this beautiful city at a smooth and leisurely pace. ..and learn why General Sherman did not burn the city in 1864! 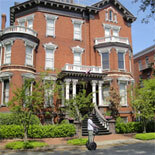 Glide through the historic district of Savannah on a Segway PT. Segways can take you places a car or bicycle can't. Experience a ride through history while learning about the local architecture, squares, monuments and the interesting people who have made Savannah what it is today. A Segway PT quickly feels like an extension of your own body, making it easy for you to remain confident, comfortable, and in control - even when it's transporting you at speeds of up to 12.5 mph/20 kph, or about the pace of a brisk run. Stand on a Segway PT and it remains stationary and upright, balancing you appropriately. Shift your weight forward, backward, left or right, and LeanSteer technology immediately sends you gliding in the precise direction you want to go, at exactly the speed you want to move. Savannah's southern climate is mild enough to be enjoyed year round. 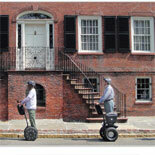 So book your tour today and get your eTickets for the Historic Tour of Savannah by Segway! All tours start with a safety video and orientation prior to the tour time. *Please arrive to your assigned tour start time for helmet fitting, safety video and practice session. Small break half way thru tour. 16 years old minimum accompanied by an adult. 1. Start by watching a helpful 15 minute Orientation and Safety Video. 3. Undergo one-on-one Segway rider training. This training ensures the rider is able to get on and off, move forward, backward and make turns. 4. You're ready for your tour with the tour guide! 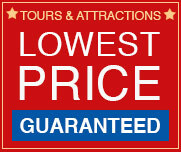 The knowledgeable tour guides are Certified by the City of Savannah.